How to clean anything with hydrogen peroxide! I've written a lot about individual uses of hydrogen peroxide, and NOW I'm ready to write this super-hyper-fancy-silly-general-everything page, where I will cover the entire scope of cleaning - disinfecting - sanitizing - deodorizing - bleaching everything under the sun. Really, this is kind of a joke -- because there are specifics things to know about using peroxide for some particular things...... And yet, there really are only so many ways to do things. The bottom line? When in doubt, SOAK IT IN PEROXIDE! Living things are very sensitive! 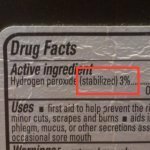 Too strong a solution of peroxide can do real harm to: people, plants, animals, skin, fur, fruit, vegetables, and sprouting seeds. Please find out the appropriate level of dilution to use when dealing with people, animals, and plants. Use caution in bleaching -- you don't want uneven results. Bleaching hair and teeth often uses higher strength hydrogen peroxide, which you should not get on your skin or gums. Bleaching is usually done by professionals. Use caution with metal things. Contact with hydrogen peroxide will tend to make metal rust faster. That's all I can think of.... what did I miss?